While we write, police forces are expanding the off-limit area, trying to clear the baita in order to demolish it. Fifteen protesters are resisting in it. One notav protester, chased by police, climbed on an electric pylon, and then fell down (from 10 meters high) after taking a shock. He’s now under surgery in Turin, ambulance transportation has been delayed by police for almost an hour. Roadblocks and rails occupations by notav protesters have started in Valsusa and solidarity actions are being planned in all Italy. More updates later on. Protesters marched for over 8 km, from Bussoleno to Susa, passing toward the zone where the international station of Susa and the entrance of the main tunnel are supposed to be built. 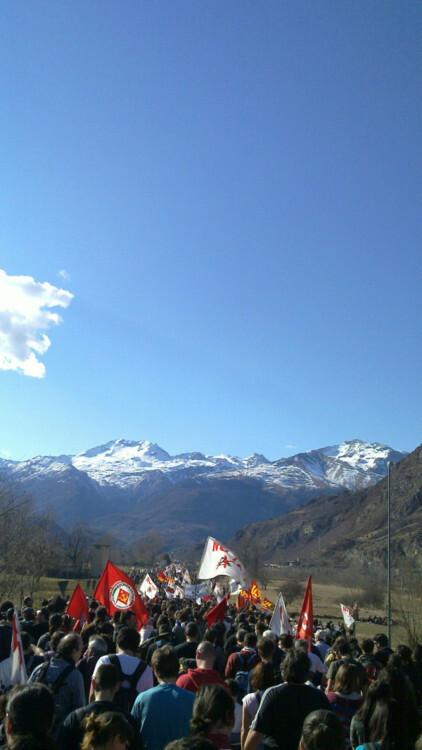 This march has been thought as a concrete sign of the fact that most of the majors of the town in Susa valley still walk side by side with the movement, despite the great campaign orchestrated against the movement with the arrests (see link at bottom), the great mediatic echo given to the protests against judge Caselli, or the repeated alarms (by Antonio Manganelli, chief of Italian police and, in a more veiled manner, by Massimo D'Alema, former prime minister and today one of the Majors of PD) about supposed violent infiltrations in the movement. The march have been very participated (75.000 people for NoTAV movement , less than 10.000 for police1) and calm, but the government shows that it is not intentioned to take in any care On Saturday 25 February a new NoTAV demonstration took place. NoTav’s reasons, and police forces are preparing an expansion of the off-limits zone, probably basing on supposed public order reasons, since the legal procedure for expropriation of the land have not been completed yet. This regardless of the fact that the area is more than 2 km far from the nearest house. The methods and the timing of this operation suggests more interest in suffocating the protest than in providing the condition for the excavations to begin. Many NoTav activists suppose similar reasons are beyond the police forces’ assault in Torino railway station, directed to protesters coming back home but ended up involving most of the passengers of Torino-Milano train. Giorgio Cremaschi, member of FIOM (largest Italian trade union of industrial workers) central committee: "I was on the 19:50 train to Milano, I’ve seen actions absolutely unjustified and unjustifiable from police forces which seemed to have completely lost reasons hitting with truncheon not only persons but also train windows". It’s worth to remember that the chief of railway police in Torino is Spartaco Mortola, involved in the police aggressions in Diaz School in 2001 G8 summit in Genova. Notav movement, in an assembly on 26 February decided to resist to this expropriation with a non violent action and, if the expropriation will succeed, as it’s likely to be since more than 1000 policeman are supposed to be involved in the operation, to reply with roadblocks in the valley and, hopefuly, in many other places in Italy. 1 Wednesday 22 february, in an audition to the parlament, Antonio Manganelli declared that the march of 3 July (see ‘Around the fortress’) have been partecipated by 80.000 people, but official declarations of italian police speak about only 8.000. More info and related article here. Thanks for this update guys, really interesting (and sad for the guy in hospital)..
One thing, if you can, try to use tags already there (like 'TAV' not 'NoTav') and if you select a country from the box you don't need to tag it again (coz it just creates new, empty tags).. But yeah, apart from that, cheers for this and good luck to the No Tav movement!